Be warned! This stuff is addictive. It is one of those things where you sit down with a bowl of it so you can write a well informed post, and the next thing you know the bowl is gone. "This darn bowl must have a hole in it" you say to yourself as you get a little more. The next thing you know, your fingers and salty and covered in dill and your belly is full. Not that happened to me. I only had a few dainty little pieces. I swear. 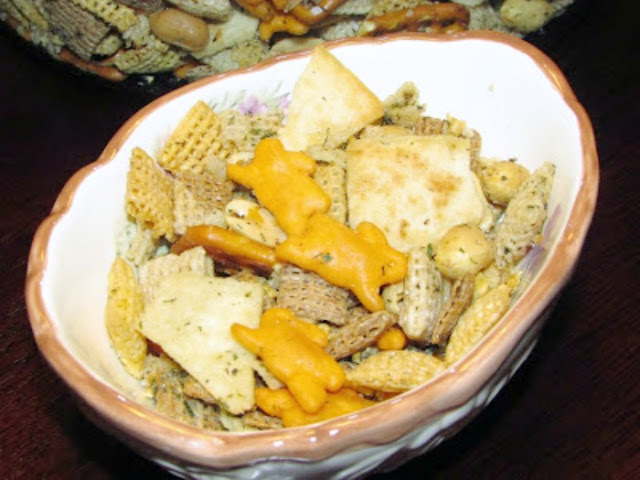 MiMi made this for Easter, so the cheddar bunnies were especially cute! This mix is a bit brighter than than the original mix that has Worcestershire sauce in it. It was well received. She made a huge batch (probably at least double... maybe more) and all I had left was a little half gallon tub. I bet I wouldn't have had any if I had put a bowl of it outside too! I love snack mixes. My husband's Grandmother makes a delicious mix I have called "the yummy stuff" (I think it is really called Nuts and Bolts). This reminds of it. Thanks for sharing at Idea Box! I find most snack mixes really addictive! I like them savory or sweet... I don't really care which way. Just keep the big bowl at a distance if you want any left to share!! I will have to look for a recipe for nuts and bolts, I am intrigued! OH, I can totally believe this stuff is addictive! I'm a sucker for any sort of salty snack mix like this and dill is a favorite flavor of mine! It is terribly addictive! I love dill too. Mine is coming up in my herb garden. It is always fun to see what volunteers in the spring! I love these types of snack mixes, they go fast around my house too! I love dill and it sounds like a nice addition, pinning. Thanks for sharing at What'd You Do This Weekend?! It is a nice alternative to the traditional snack mix. I hope you enjoy it! Thanks for hosting. Hey there! Thank you so much! I hope you are having a great weekend and I'll see you Monday! YUM! I love ranch flavored ANYTHING. Me too! 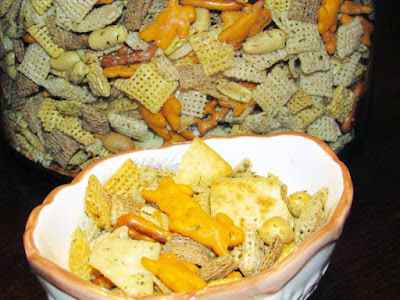 This was a nice change from the traditional snack mix... but just as addictive! I would make this, but I would probably eat it all! At midnight! lol! Seriously, it sounds like a wonderful combo. It is delicious! 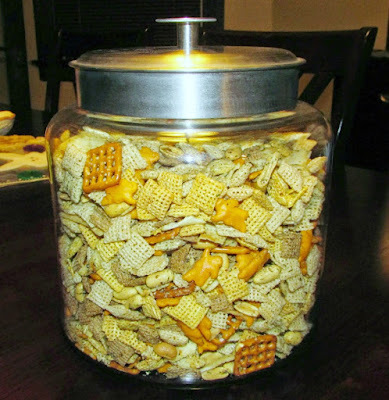 My brothers looooove chex mix, but this is a springier version. We all have a hard time keeping our hands out when a bowl of snack mix like this is out!